The age of a western red-cedar can be roughly estimated by looking at the tree’s crown. For the first several centuries, the top of the red-cedar has a relatively simple crown. However, with age, the crown form changes and candelabra tops – which are often seen in ancient trees – begin to emerge. (See drawing). 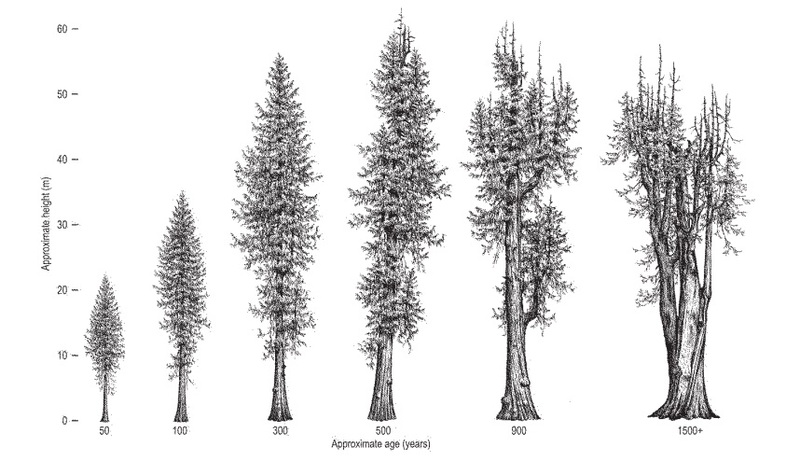 Interesting facts like this and more can be found in DNR’s guides for identifying old trees and forests in Washington: Identifying Mature and Old Forests in Western Washington and Identifying Old Trees and Forests in Eastern Washington, both written by Robert Van Pelt, PhD. Both guidebooks are free to download.